Crape myrtles have been slow to catch on in the Pacific Northwest for a variety of reasons. They’re thought to be unsuitable for our wet climate, and not cold hardy enough to survive here. But that’s not true, according to garden writer Kim Pokorny. 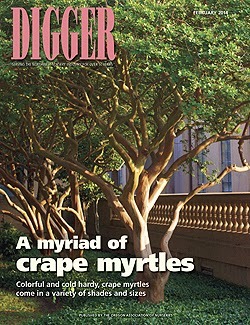 Her cover story in the fresh-off-the-press February issue of Digger gives a myriad of reasons to love crape myrtles (PDF). • “To garden is to care” (PDF) — Columnist Mike Darcy praises the examples of gardeners who have come to the aid of others in times of need. • “Meet the Leader: Mike Coleman” (PDF) — OAN’s president-elect says labor and immigration are the industry’s most challenging issues. • “Container management” (PDF) — Growers can choose from a variety of supplies and methods that help stabilize stock against wind and other factors. • “Demystifying Rhodococcus fascians” (PDF) — Prevention is the grower’s best defense against this tenacious pathogen.